Time to put 1989 on display and celebrate the 30th anniversary of the year that was closing the 80's decade. Known as the year of revolutions that swept through the eastern block countries in Europe as well as the year of innovations which brought the first commercial internet services. Musically the charts were still dominated by Stock-Aitken-Waterman hits also introducing Donna Summer to their hits factory. 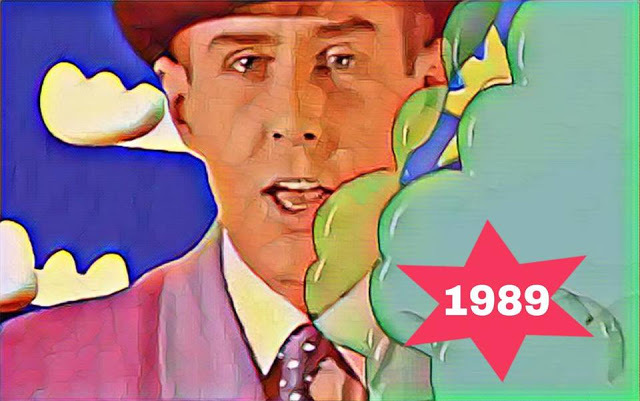 The second half of 1989 was also dominated by the the growing House music genre led by Inner City and S'Express and Italo disco which evolved into Eurodance. Even though the 1989 chronologically belonged to the 80's decade, it clearly sensed the 90's spirit in all terms and the music styles that started in late 90's eventually reached their peak points in the 90's and beyond. 'Technique' is the fifth studio album by New Order, released on 30 January 1989 by Factory Records. It was also New Order's final studio album to be released under Factory Records before going bankruptcy in 1992. 'Technique' was the first New Order album to reach number one on the UK charts, and "Fine Time", the first single from the album, reached number 11. The album has been listed by several publications as one of the best albums of the 1980s and of all time and has been reissued in 2008 as collectors edition. 'Hats' is the second studio album by The Blue Nile, originally released on 16 October 1989 on Linn Records and A&M Records. It also became the band's most successful album, reaching number 12 on the UK album charts and spawning three singles: "The Downtown Lights", "Headlights on the Parade", and "Saturday Night". In November 2012 Virgin Records released two-CD "Collector's Edition" versions of 'Hats' and its predecessor 'A Walk Across the Rooftops' in the UK and Europe, each containing a remastered version of the original album plus a second CD of bonus tracks. 'Floating into the Night is the debut studio album by Julee Cruise which was released on September 12, 1989 on Warner Bros Records, and features compositions and production by Angelo Badalamenti and film director David Lynch. Two singles were released from the album: "Falling" and "Rockin' Back Inside My Heart", both of which were featured in the television series Twin Peaks. The album received a CD reissue in Europe in October 1998 and a LP repressing by Plain Recordings in the United States in October 2014. 'The Seeds of Love' was the third album by Tears for Fears released in 1989 Fontana/Mercury. The album was an international success, entering the UK Albums Chart at number one and reaching the top ten in numerous other countries including the US. It featured the hit singles "Woman in Chains", "Advice for the Young at Heart" and the title track. Despite its success, it would be the last album that band members Roland Orzabal and Curt Smith would work on together for over a decade. The album was remastered for the first time in 1999. 'The Sensual World' is the sixth studio album by Kate Bush which was released in October 1989. It featured the hit singles "The Sensual World", "This Woman's Work" and "Love and Anger" and it has been certified Platinum by the BPI for sales of 300,000 in the UK after peaking at No 2. In 1991, the album received a nomination for a Grammy Award for Best Alternative Music Album and the singer was also nominated for two BRIT Awards in 1990 as Best British Producer and Best British Album of the Year for the album "The Sensual World". was promoted with three singles: "Down in It", "Head Like A Hole", and "Sin". A remastered edition of the album was released in 2010. 'Like a Prayer' is the fourth studio album by Madonna, released on March 21, 1989 by Sire Records. Beside others, the album was also co produced by Prince and has been described as a confessional record which was devoted to her family and especially to her mother. All together there were 6 singles released from the album including some of her biggest hits, "Like a Prayer" and "Express Yourself". This period also marks the peak in her musical career. Automatic is the third album by The Jesus and Mary Chain recorded by the core duo of brothers William and Jim Reid with a drum machine providing the rest of the instrumentation. The album contains their most successful single in America up to that point, "Head On" and although originally poorly reviewed, the album has improved with the passage of time which is confirmed by the fact that it has been reissued several times since 2006. 'Bizarro' is the second studio album by The Wedding Present which was released in October 1989 by their record label, RCA. The album was promoted with only one single release entitled "Kennedy" which provided them a very first top 40 hit in the UK. This is a very mixed record where it is evident that the band moved away from the jangle punk of the debut to a nastier darker fronted sound. A remastered CD version, released by BMG Camden in 2001, also features the B-sides of the "Kennedy" single. 'Playing with Fire' is the third studio album by Spacemen 3, released in February 1989 through 'Fire'. Like on their previous album the songs were written by the band and only one song, Revolution was released as a single, during the same year. The album was released on several different labels in different countries and it was reissued in 2001 for the first time.The album was featured in Robert Dimery's '1001 Albums You Must Hear Before You Die'. Bel Canto released their second studio album 'Birds of Passage' in 1989 via IRS/MCA /Nettwerk Records. Over time their music evolved from an ethereal dream pop sound to synth-based pop influenced by world music. Two singles were taken from the album, the title track and 'A Shoulder to the Wheel', released in 1991. The album was reissued in 2005. ‘90’ is the second studio album by 808 State, released on 4 December 1989 as their first album on ZTT Records. The album features the single "Pacific State", which reached number 10 in the UK Singles Chart in November 1989. The album is one of the finest albums in the acid house genre which paved its way into the 90’s. The album was reissued in September 2008, as a deluxe edition including bonus disc of remixes. ‘Street Fighting Years’ is the eighth studio album by Simple Minds, released in May 1989 by record label A&M and produced by Trevor Horn. After adopting the arena rock sense on the previous album, the band incorporated acoustic and Celtic/folk music-related ingredients and became more political on this record. Five singles were released from the album including “Belfast Child” which reached No 1 in the UK charts and remains as one of band’s biggest hits. The Album was reissued in 2003. 'Twist of Shadows' was the third release for The Clan of Xymox after their label change and when they decided to shorten their name to simply Xymox. The album was produced by Peter Walsh, the acclaimed producer of Simple Minds' 'New Gold Dream' and launched several charting singles in the United States including "Obsession" and "Imagination". It remains as band's most successful album to date and was reissued last year. 'Blind Man's Zoo' is 10,000 Maniacs' fourth studio album, released in 1989 through Elektra. The album contains songs addressing social issues and current events prior to and during the production of the album and the title of the album ‘Blind Man's Zoo’ was inspired by a fictional game from a children's book. Four singles were released from the album including “Trouble Me” which was written was dedication to the lead singer Natalie Merchant's father. So far the album has not been remastered. 'Protest Songs' is the fourth studio album by Prefab Sprout by Kitchenware Records and CBS in 1989. The songs were recorded in 1985 and it was intended to be released for this year, but it was postponed. The album as whole was produced by the band and all songs were written by Paddy McAloon in a superb, reflective and evocative tone. "Protest Songs' was reissued in 2009 as part of 20 year anniversary. 'Snowball' is the debut album by The Field Mice which was originally released as a 10" vinyl LP on September 4, 1989 through Sarah Records. This album is one of the many gems of the 'twee pop' necklace for which Field Mice were definitely the centerpiece and the absolute highlight of 1989. During the same year, they also released their marvelous single "Sensitive" which only appeared on the album when it was reissued in 2005. 'Sue' was the debut album by Brighton based Frazier Chorus who were originally signed to 4AD, but released this album on Virgin Records. The album included 11 track in the Adult contemporary dream pop style out of which three were also released as singles, most notably "Typical". This albums has some finest pop arrangements of the late 80's decade and in 2008 it was reissued by Cherry Red Records. 'Waltz Darling' is the fourth studio album by Malcolm McLaren released in 1989 on Epic. The album spawned several popular singles, most notably "Waltz Darling" and "Deep in Vogue", a collaboration with Willi Ninja which introduced vogue style of dance to the mainstream. On this album McLaren experiments with Classical music trying to incorporate it into his pop songs in so called Classical Crossover which is sort of love or hate thing. Out of the five singles released four managed to reach the UK charts. So far the album was not reissued. 'Results' is the ninth studio album by Liza Minnelli released in 1989, produced by Pet Shop Boys and Julian Mendelsohn. In 1988, Minnelli had expressed an interest in doing a pop album, completely in contrast with her normal output with Epic Records and soon after find herself in collaboration with Pet Shop Boys. The first single released was a decidedly electronic working of the Stephen Sondheim song "Losing My Mind" in August 1989 became a big hit in the UK, peaking at No.6. The album was re-released by Cherry Red Records, in an expanded edition with 4 discs (3 CDs and 1 DVD), on September 25, 2017. 'Take Care' was the second album by Graham Lewis of Wire which he release under the He Said moniker. It included 8 tracks and the side a is more synth pop flavoured and side be varied from ambient to more upbeat tunes. Unlike the previous album, there were no single releases taken from 'Take Care' and it was never reissued.